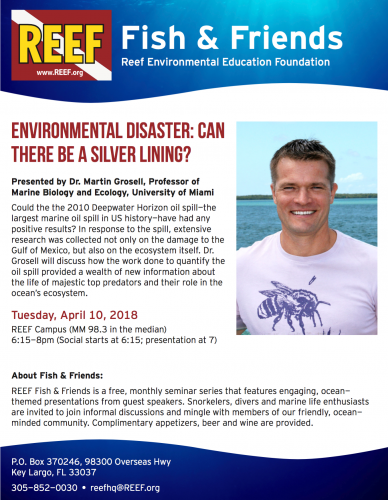 Tomorrow night,Tuesday April 10th, Dr. Martin Grosell, will be the guest speaker at REEF’s Fish and Friends event, in Key Largo. His talk “Environmental Disaster: Can There Be A Silver Lining?” focuses on the extensive research on the Gulf of Mexico ecosystem in the wake of the 2010 Deepwater Horizon oil spill. This free seminar series hosted by REEF occurs monthly and features presentations that focus on ocean conservation. Join Dr. Grosell and others from the ocean friendly community at 6:15pm for informal discussion on ocean conservation, marine pollution and enjoy complimentary food and drinks!